Woo hoo! Today is our day to participate in this fun hop! First, the bunnies and I would like to send a big thank you to our hostess, Wicked Wendy over at Why Knot Kwilt and to the ever so talented Madame Samm of Sew We Quilt. Did you see the film trailer Samm made for this hop? It was so cool! Alrighty then, let's get hopping along. 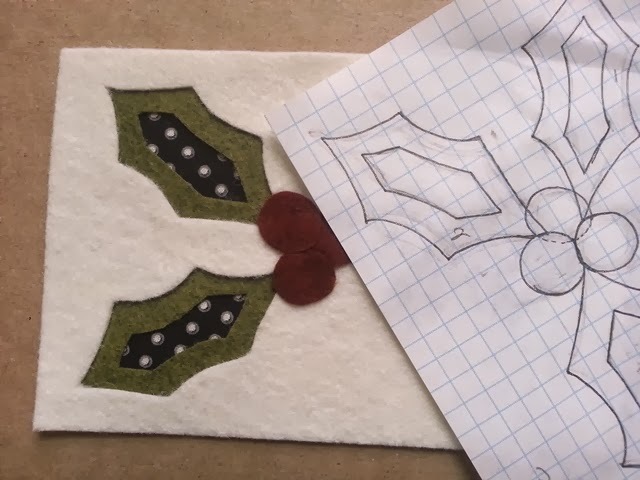 You know I absolutely love, yes love, working with wool felt and Valdani floss. You also know that I love decorating. Well, I decided the pumpkins David carved for our mantel needed some friends. to make a Bitty Bat banner for my fireplace! Now say, "Bitty Bat Banner" three times fast. hee,hee,hee. I'm such a dork. *Please note, I'm currently in Houston at quilt market, so if you order a paper pattern, it will be next week before it is mailed to you. Thank you for visiting with me and the bunnies. Now we invite you to hop over and visit our friends who we are delighted to share this day with. This little bunny is headed to Houston Quilt Market. I will be in the Valdani threads booth signing books. If you are going to market, please hop over and see me! See you tomorrow for the Wicked Blog Hop. A Wicked Week of Fabulous Fun! It all starts today! 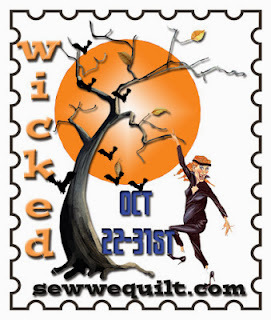 The Wicked Blog Hop! The bunnies and I are excited to be hopping in on Friday. Until then, we invite you to visit our wonderful, Wicked, hostess, Wendy and the ever so talented, Madame Samm over at Sew We Quilt for the list of participants and prizes! Woo hoo! Prizes! We'll see you Friday. Until then, we thought you might enjoy a little Moon Trance with our favorite violin gal, Lindsey Stirling. Let's do a little zombie dance together shall we? Party! Wishing you some wicked fun this week! We're pooped. There's been too much work going on around here. Mama keeps saying "deadlines" and then runs off mumbling other things. We're taking the weekend off. She can keep working. Hi ya! Are you having a fun week so far? It's still raining here in NC. It makes me sleepy especially when I've been on the computer for so long. Must...have...coffeeeeeeeeee! Since the release of my Fabled Fusions book, I've had a bunch of people ask me for wool and floss kits for the projects. David was a lifesaver and helped me put them together on Monday. Please note, there are limited quantities available. 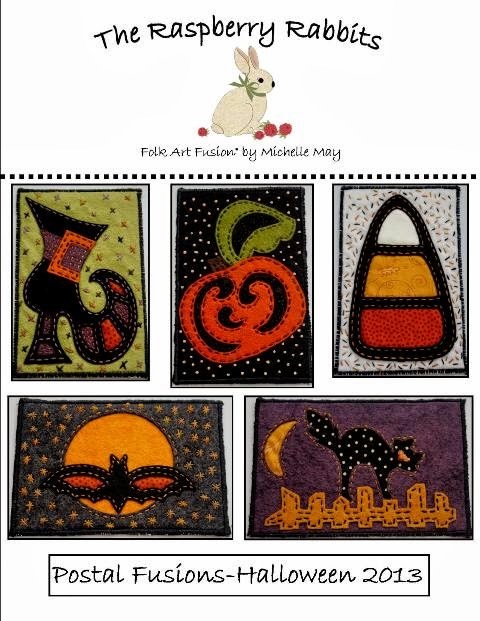 There is a wool, floss and polka dot fabric kit available for each of the patterns in my book. The book is sold separately. 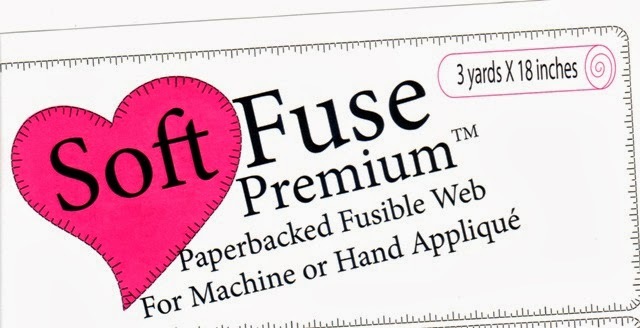 Also, I have some Soft Fuse fusible web back in stock. I was extremely lucky to get a shipment. More and more people are falling in love with this fusible and the company is experiencing growing pains. So if you want some, now is a good time to get it. Hop over to my SHOP for kits and supplies. The bunnies and I truly thank you and appreciate your business, especially during these hard times. There are a million ideas bouncing around in my head right now. I'm finishing up the Postal Fusions for Christmas. Here's another sneaky peeky of one. They are so much fun! They will be available soon as a paper pattern, kit, or instant download on Craftsy. Stay tuned! Hi ya! Did you have a fun weekend? It was raining here the entire time. Nice for getting stitching done, but not nice for taking photos. Poo! This is a new Folk Art Fusion design I was working on about two months ago. I thought for sure I would have it all put together and ready to go by the end of September. NOT! This week I am getting prepared to go to the Houston Quilt Market. I leave next week. Valdani has asked me to be a guest in their booth again this year. I will be signing copies of my book and showing my floss collection. See ya back here Wednesday. Hi ya! Well, here we are at Friday again. It's been another busy week in Bunnyville. I'm working on my Postal Fusions - Christmas 2013 designs. They will be available soon, so stay tuned. Until then, here are two sneaky peeks. 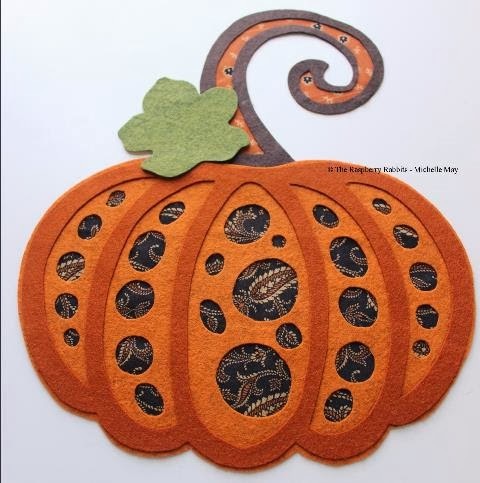 Of course, you still have time to make and send some Halloween Postal Fusions. I sent some off to a few friends and they loved receiving them in the mail. 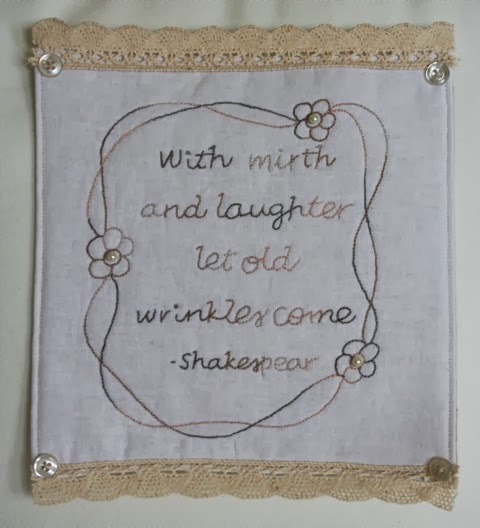 you can download them right now from my Craftsy shop and get started today! They are super fast and fun to make. 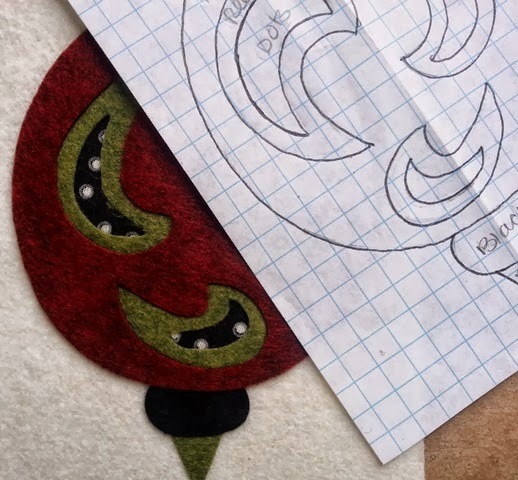 I like to have quick projects to do while I'm working on a larger one. The bunnies are worn out and taking today and the weekend off. Wish I could plop down and take a nap with them. 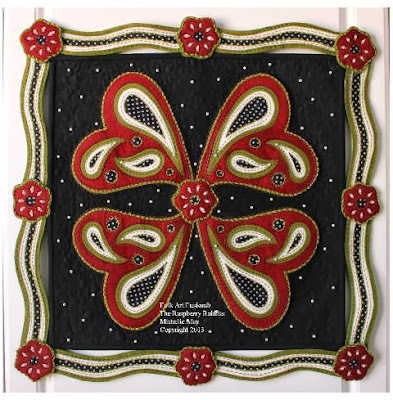 In 2011, while attending the Mid Atlantic Quilt Festival, I stumbled upon this quilt. You know I fell in love with it at first sight. I even blogged about it back then. Little did I know, that two years later, I would be having a Play Date and Chat with the Cabin Branch Quilter's Guild in Virginia. Little did I know that I would be invited to stay at the home of the guild's Vice President. Little did I know that the VP was the creator of that wonderful rabbit quilt I fell in love with. Please meet, my new and dear friend, Shannon Shirley of Once in a Rabbit Moon. 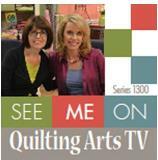 Shannon is a designer, author, quilt maker, speaker, instructor and...bunny lover!!!! This is the room I was invited to stay in. Vintage and new quilts everywhere! Charming vignettes in every corner. When I woke in the morning, this is the first thing I saw. Bunnies!!! I smiled and thought to myself...this is the BEST guest room EVER!!!! There is so much warmth and love throughout Shannon's home that she shares with her delightful mom. The back porch filled with bunnies of course! Her quilts hanging on a ladder. Vintage pieces mixed with new. and then I saw her...Dottie the pig. Again, while visiting the Mid Atlantic Quilt Festival in 2012, I fell in love with this pig. Dottie the pig. Shannon, yes Shannon, was the creator of this quilt I adored at that show. How cool is that! This is Shannon's studio. Her father, who has since passed away, helped her build it. It's on the third floor of her home, nestled high in the trees. Light, love and creativity fill this space. Shannon has won many ribbons and awards for her work. She is truly a remarkable lady and well deserving of each award. This is the classroom in her home. Yes, she even has a classroom to share the art of quilting. 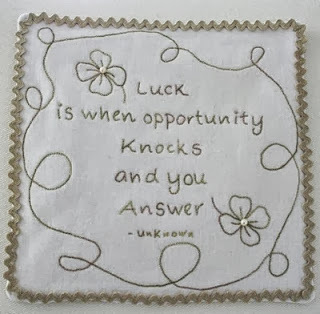 This sign hangs on the door to her classroom. The rabbits are actually a vintage bookmark. Awesome! is that once in a rabbit moon, a new friend is brought into my life, and that new friend, will be my friend, for my entire life. Light, love and hugs to you Shannon. Who Needs a Play Date? How about a Chat? Hi ya! How was your weekend? Mine was super awesome as I packaged and mailed out Fabled Fusions to all my friends who pre-ordered. It was so exciting to see all the places in the world they were going to. It's so fun to play with these designs. Speaking of playing, who needs a play date in Bunnyville? A what? Well, your kiddos and grandkiddos have play dates with their friends, people take their dogs on play dates with other dogs, so I decided I wanted to have a play date with you! Yep, a Play Date in Bunnyville. I bring my studio to you and we have lots of fun creating a Folk Art Fusion project together. 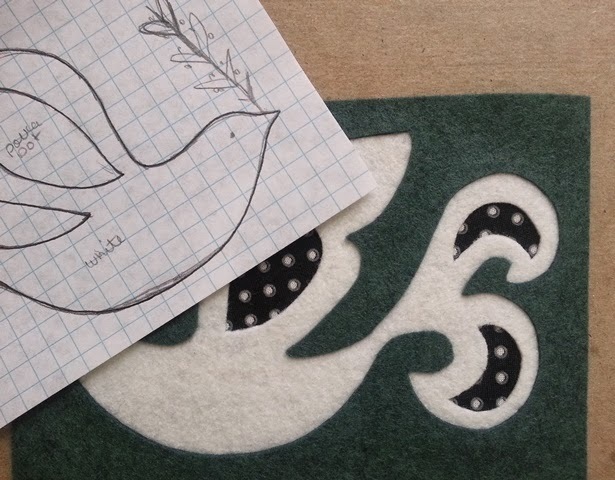 I have always loved teaching and it, along with designing and bunnies, is my passion. Recently I had the most wonderful time with the Cabin Branch Quilter's Guild in VA. Here are a few of my "playmates" showing their O'Ryan the Stargazers. Hi girlfriends! They were so much fun! So, are you ready for an adventure with The Crazy Bunny Lady? 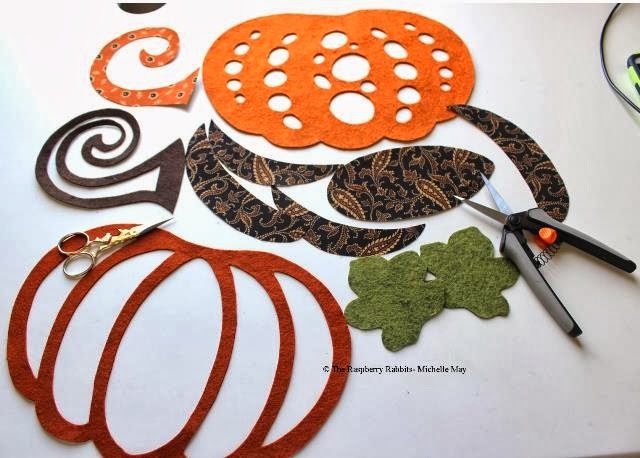 Tell your guild VP or local quilt shop that you NEED a play date! Hop over HERE to read more and book your date now. I would love to spend a day with you! "Harrington, did you hear that?" "It sounds like a big truck Hannah. Is that what I think it is?" "Yep, Mama's out in the driveway doing the happy bunny dance. They're here! They're here! Thanks so very much to Bill and Roger across the street for helping to get this big delivery up the driveway and into the garage." "They are finally here. 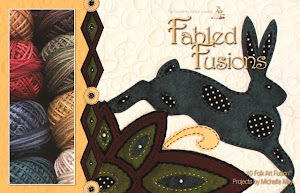 Mama's Fabled Fusion books. We are all so very excited. Our sincere thanks to everybun who pre-ordered the book back in June and July. Your books are on their way to you. Thank you auntie Lyd for helping with the packaging." "For our new friends, if you would like to purchase Mama's book, simply click HERE and it will take you to our shop." Last for today is the final three blocks in "A Sentimental Journey." "Well Harrington, I don't think we will get the weekend off. Mama said something about needing more packaging tape." Hoppy Friday! See ya back here on Monday!